Just as the Vietnam War presented the United States with a series of challenges, it presents a unique challenge to teachers at all levels. The war had a deep and lasting impact on American culture, politics, and foreign policy. Still fraught with controversy, this crucial chapter of the American experience is as rich in teachable moments as it is riddled with potential pitfalls—especially for students a generation or more removed from the events themselves. Addressing this challenge, Understanding and Teaching the Vietnam War offers a wealth of resources for teachers at the secondary and university levels. An introductory section features essays by eminent Vietnam War scholars George Herring and Marilyn Young, who reflect on teaching developments since their first pioneering classes on the Vietnam War in the early 1970s. A methods section includes essays that address specific methods and materials and discuss the use of music and film, the White House tapes, oral histories, the Internet, and other multimedia to infuse fresh and innovative dimensions to teaching the war. A topical section offers essays that highlight creative and effective ways to teach important topics, drawing on recently available primary sources and exploring the war’s most critical aspects—the Cold War, decolonization, Vietnamese perspectives, the French in Vietnam, the role of the Hmong, and the Tet Offensive. Every essay in the volume offers classroom-tested pedagogical strategies and detailed practical advice. 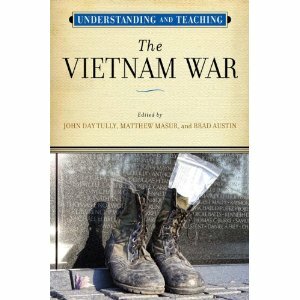 Taken as a whole, Understanding and Teaching the Vietnam War will help teachers at all levels navigate through cultural touchstones, myths, political debates, and the myriad trouble spots enmeshed within the national memory of one of the most significant eras in American history. John Day Tully is professor of history at Central Connecticut State University and was the founding director of the Harvey Goldberg Center for Excellence in Teaching at Ohio State University. He has coordinated many Teaching American History grants and has received the Connecticut State University System’s Board of Trustees Teaching Award. Matthew Masur is professor of history at Saint Anselm College, where he has served as codirector of the Father Peter Guerin Center for Teaching Excellence. He has also been a member of the Teaching Committee of the Society for Historians of American Foreign Relations. Brad Austin is professor of history at Salem State University. He has served as chair of the American Historical Association’s Teaching Prize Committee and has worked with hundreds of secondary teachers as the academic coordinator of many Teaching American History grants.